The team of Martin & Lewis (Dean Martin and Jerry Lewis, of course) return to the screen in the sequel to their first film, My Friend Irma.This time, the ditzy blonde Irma (Marie Wilson) leads her roommate Jane Stacy (played by Diana Lynn), Jane’s fiancee Steve (Dean Martin), and her own boyfriend Seymour (Jerry Lewis) out west to try and break into the movies. There’s a kidnapping plot, but the highlights of the film are Martin and Lewis recreating bits of their nightclub act, such as The Vagabond Song. 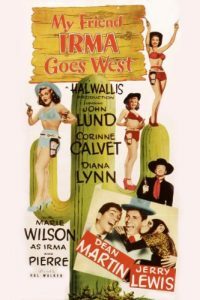 My Friend Irma Goes West picks up where My Friend Irma left off, with agent Al (John Lund) is still trying to promote Steve’s (Dean Martin) career. Eventually, Steve gets booked to a local TV station and is spotted by a movie producer. He is offered a contract and Steve, as well as the rest of the gang, Irma (Marie Wilson), Jane (Diana Lynn) and Seymour (Jerry Lewis), all head to Hollywood. However, the trip ends in disaster when the “producer” is discovered to be an escaped lunatic. Al tries to set things straight by taking the gang to Las Vegas to work at a casino, but things aren’t as they seem. Ditzy Irma causes trouble by wrecking a rigged roulette wheel and gets kidnapped and held for ransom until Al can raise $50,000. In the meantime, Seymour, dressed as an Indian brave, locates Irma and rescues her. The publicity received during the entire fiasco brings another movie offer… but this time for Irma and Seymour. Jane Stacy (Diana Lynn): Irma, are you keeping something from me that I should know? Irma Peterson (Marie Wilson): Jane, you can beat me, you can torture me, you can rack me on the wheel, you can quarter me into six and a half pieces, but you’ll never find out from me that Yvonne, the French actress, is responsible for Steve singing at the Lucky Dollar Club. Seymour (Jerry Lewis): Hear, hear! I hear there’s a call for able-bodied men. Sheriff: Yeah! Do you know one? Seymour (Jerry Lewis): I know me! I’m able! I’m a man, and despite what you think, this is a body! Sheriff: Sorry, son, I can’t take you without your mother’s permission. Slim: [to Pete about Irma] Don’t shoot her in the head. The bullet’ll never go through. Irma Peterson (Marie Wilson): I miss my mother and father. They were just like parents to me.